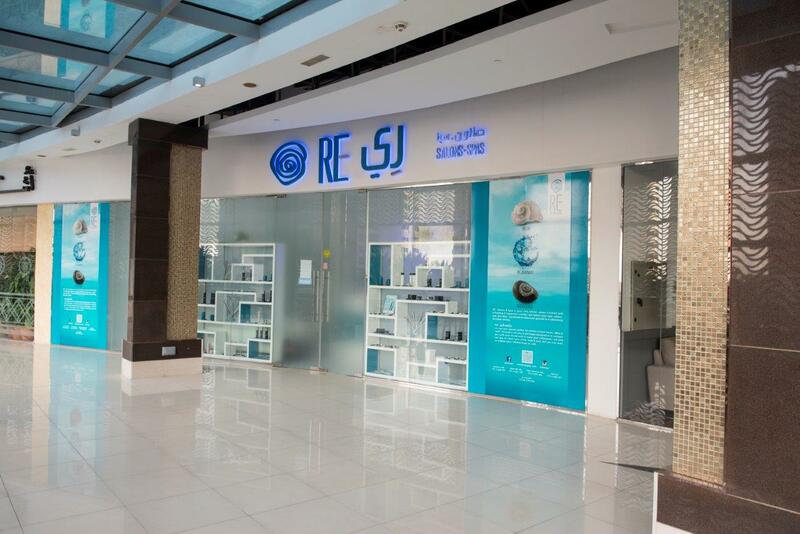 Based in the UAE, RE- Salons & Spas is an award-winning beauty and wellness chain. The focus is on a holistic approach to both inner and outer beauty – transforming customer’s lives through an innovative menu, contemporary setting and quality services tailored to today’s hectic urban lifestyle. RE-Salons & Spas has been awarded as the ‘Best Beauty Salon’ at the prestigious ‘Middle East Pool And Spa Awards 2016’. They are the definition of ‘affordable luxury’. Re-Salons understands that wellbeing is more than just a list of services and that true beauty comes from sharing love, compassion, and happiness. As the perfect host, whether in a RE- Salons & Spas outlet or at your own premises, RE- provides the ideal setting for some all-important ‘me-time’ and ‘we-time’ – because feeling good is as much about connecting with yourself as it is with bonding with those around you. Experience a journey through all that RE- has to offer: RE-lax with pampering massages and facials; RE-juvenate with indulgent salon treatments, and RE-discover yourself through the unique range of home services, corporate wellness packages, and sparties (spa parties)! RE- Salons & Spas continues to innovate in the industry with unique promotions that have the busy and money-savvy women in mind. One example of a promotion that is unique to the local market is the monthly “All You Can Spa” deal through which subscribers can indulge in as many spa treatments as they want for a set valuable price [AED799/AED699 per month]. 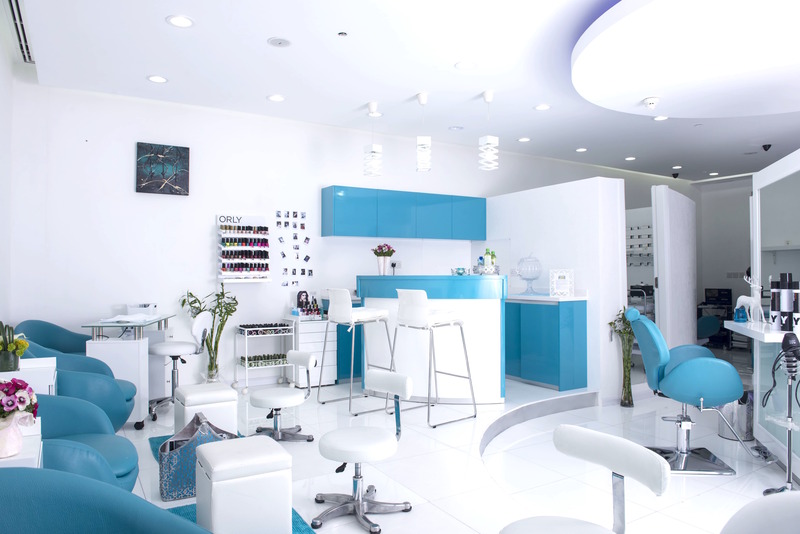 With the spas and salons market booming, it’s more important than ever for companies to come up with innovative promotions and offers in order to stay ahead of the competition; RE- makes this approach a priority. A number of industry experts who have an impressive combination of experience were on the judging panel. These include Daniella Russell, Spa Development & Operations Director of Soul Spa and DR Global; Nadine Rizk, Spa Development Consultant at Blended Hospitality; and Annamaria Lambri, Associate Professor of Interior Design at the American University in Dubai. 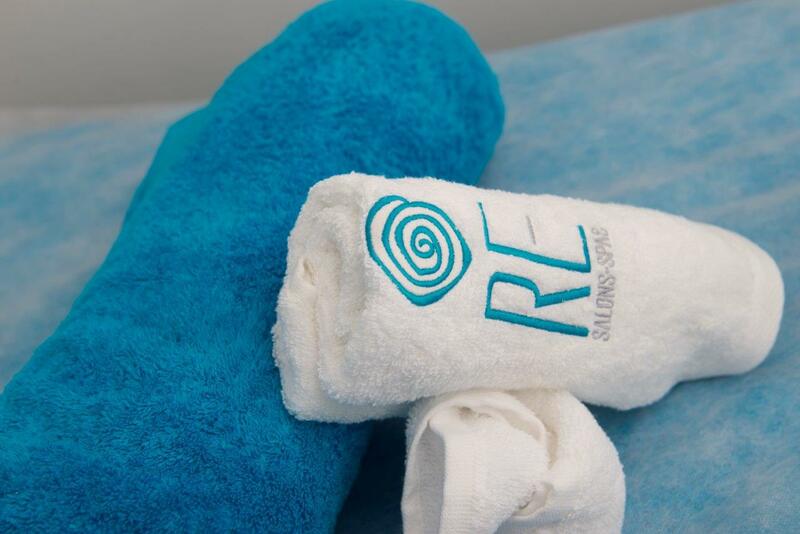 “RE- Salons & Spa has shown great potential in their rebranding, operations and treatment delivery. They have an excellent model of affordable luxury, great customer care and show excellent work towards social responsibility, which we hope becomes a strong example for many other businesses,” said Russell, a prominent spa and wellness professional with over 35 years of experience. “We are extremely honored to have won the award for Best Beauty Salon in the Middle East. Our team is always focused on providing the highest quality of treatments and holistic services in order to meet the needs of Dubai’s busy modern women, thus we really owe our success to them. At RE- Salons & Spas, we value our customers’ feedback above all else, but it’s also very important to us to receive positive recognition from prestigious industry bodies. 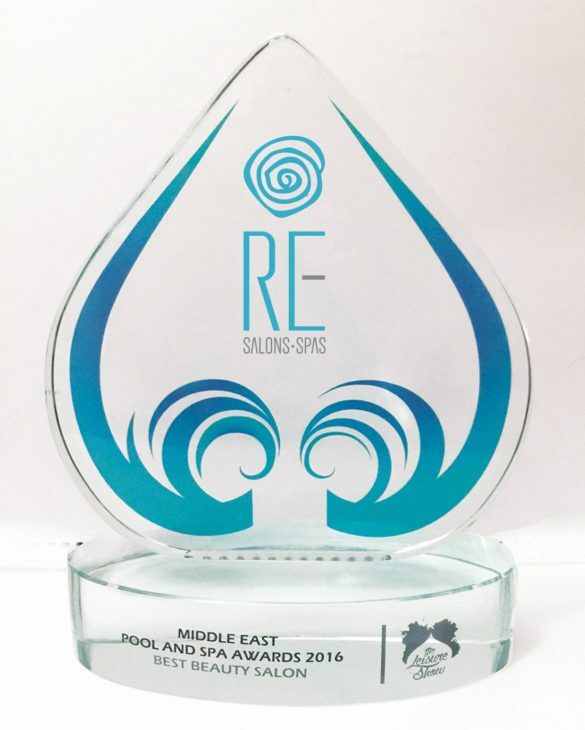 We are therefore delighted to have this recognition from the judges of the Middle East Pool and Spa Awards,” said Rana El-Eid, Founder & Chief Wellness Advocate of RE- Salons & Spas and winner of ‘Most Innovative Woman Entrepreneur’ Award. We kicked off the review with a phenomenal ’60 minutes Signature Massage’ [AED250] with a hair mask that was applied on my hair prior. Let your masseuse know in advance if you prefer a low, medium or high-intensity massage (we opted for high).My masseuse managed to reduce the knots on my back (quite a painful process that was needed) and keep me fresh by the end of the massage! 🙂 Although the massage was relaxing, the music was a bit too loud. The volume was unstable, a few minutes it was low and then high, up until I asked them to consistently keep it low. Followed by my massage, I got a quick hair wash that left my hair feather-soft and a wonderful gelish manicure [AED130] with a chrome galactic finish ???? Claudiana was my nail artist and she is one gem of a woman! Her expertise led me to change the shape of nails (that I’ve had for years). Her suggestions revolved around how to make my chubby fingers look better with my nails. 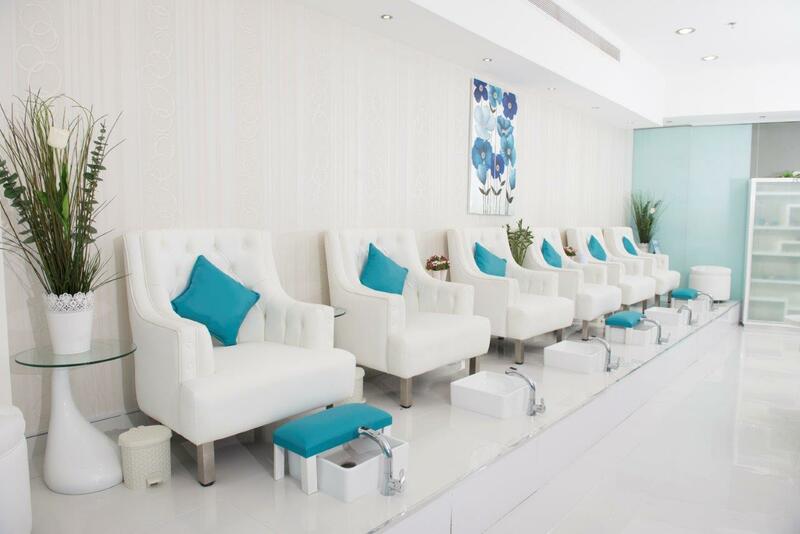 As I was getting my nails done, my hair was being blow-dried [AED120 – long hair]. The end result was quite nice 😉 You be the judge? A treatment that deserves to be highlighted was the ‘Tummy Tuck Fire Therapy’ priced at AED200 for 45 minutes. It starts with a painful tummy massage with course coffee and oil. This massage is vital since it breaks down all the tough and rigid fat cells growing beneath. Followed by the massage, I was wrapped with a transparent wrap to keep the sagginess intact. Wrapping a body part for ‘x’ number of hours triggers stiffness and fat loss. Upon wrapping the waist line, a cloth is placed on top of your stomach that is then drenched with some vinegar (vinegar is used since it seeps through your pores to accelerate fat loss). Followed by drizzling the cloth with an alcohol to assist the burning ????????. While the fire is burning on top on you, it does feel like your skin is on fire, but, it is bearable. As soon as it gets unbearable the masseuse will put the fire off. If I were you, I’d try this at least once ???? They are located at Sunset Mall (Jumeirah), International City, Internet City, and Dubai Marina. Location of Sunset Mall is below. ThEATre by Rhodes or VOX Gold? so people could connect with it better. Youve got an awful lot of text for only having one or 2 pictures. I definitely wanted to send a quick comment to be able to express gratitude to you for all the stunning ideas you are giving out on this website. to have discovered your site and look forward to some more pleasurable times reading here. Thank you once again for a lot of things. info a lot. I was looking for this certain info for a long time. I as well conceive this is a very great website. You can definitely see your enthusiasm in the work you write. seems a lot of it is popping it up all over the internet without my agreement. You understand a whole lot its almost hard to argue with you (not that I personally will need to…HaHa). I know this website gives quality depending articles or reviews and other material, is there any other site which provides these kinds of stuff in quality? wish for enjoyment, since this this web site conations truly nice funny information too. What would you recommend about your post that you simply made a few days ago? I am brand new to operating a blog but I do write in my journal everyday. thoughts online. Please let me know if you have any ideas or tips for brand new aspiring bloggers. Hello very cool web site!! Guy .. Beautiful .. Superb ..
develop more techniques in this regard, thanks for sharing. Hi, Neat post. There is a problem together with your website in web explorer, could check this? IE nonetheless is the market leader and a big portion of folks will pass over your magnificent writing because of this problem. East | | Naomi D'Souza | Writer, Food & Lifestyle Blogger in Dubai. I actually do have a couple of questions for you if it’s okay. fresh you have to post. Could you post a list of all of all your shared pages like your Facebook page, twitter feed, or linkedin profile? In addition, the blog loads extremely quick for me on Internet explorer. I truly prize your piece of work, Very good post. Hello! I know this is somewhat off-topic but I had to ask. can share my personal experience and thoughts online. Please let me know if you have any kind of ideas or tips for brand new aspiring bloggers. information an individual provide for your visitors? for the good data you’ve got here on this post. I will probably be coming again to your weblog for more soon. An outstanding share! I have just forwarded this onto a co-worker who has been doing a little homework on this. anything you can recommend? I get so much lately it’s driving me insane so any support is very much appreciated. this blog on regular basis to obtain updated from most recent news update. I bought a theme and designed it to my need, with my developer. It was really informative. Your website is useful. Thanks for sharing! deserves attention. I agree with the information you’ve written so eloquently here. updated on a regular basis. It includes nice data. This is a record of all publishers in Germany. several pals ans also sharing in delicious. And certainly, thanks in your effort! What may you suggest in regards to your publish that you just made some days in the past?